If you would like to be informed of our activities, please CLICK HERE to join the email list for notification of meetings and other events. IMPORTANT: when you join a list, you will receive a confirmation email. You must click on the link in this email to confirm your request, otherwise you will receive no more messages. You can unsubscribe at any time. making Britain a better place for pollinators. Specific honey bee information will be provided on BeeBase as soon as it is available. 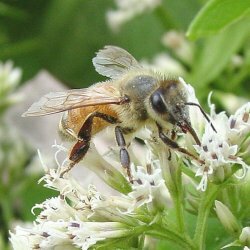 '); document.write('Beekeepers should continue to monitor their colonies throughout the winter as temperatures in some regions of the UK have been unusually high for the winter months, allowing honey bee flight and forage of pollen. In some cases, small patches of brood are still being reared and the demand on the colony\'s food resources ongoing. Where temperatures do not allow for a sugar syrup feed, fondant icing can be placed directly on the top bars of the colony, above the cluster and fed as required. This site is operated by Friends of the Bees Making Britain a better place for pollinators.